The manchineel, or beach apple, is a flowering tree found throughout Florida, the Caribbean, the Bahamas, Mexico, and parts of Central and South America. The tree mainly grows in brackish waters of mangroves and swamps along the coast. The manchineel tree is instrumental in preventing erosion by stabilizing the sand with its roots and offering a natural windbreak. However, should you come across a manchineel tree on the beach – stay far away. It is among the world’s most poisonous trees. The sap from the tree is highly toxic and can seep from the stem, branches, leaves and fruits. Although the manchineel gets its name from the Spanish “little apple,” for the apple-like fruits that it bears, it is absolutely not edible. In fact, in Spain, it’s colloquially referred to as manzanilla de la muerte, or “little apple of death.” Rumor has it that the manchineel tree is what killed the explorer Juan Ponce de Leon in 1521 on his second trip to Florida. He was allegedly struck by an arrow that had been dipped into the poisonous sap, dying shortly thereafter. Manchineels may grow up to 50 feet tall. The trees have a red-grey bark, 2 to 4-inch green shiny leaves, and bear little green flowers that give way to a fruit that looks similar to a small green apple. The milky white sap, or latex, is the most toxic part of the tree and is found in every part. It is said that even standing close to the tree puts one in danger, as the sap may drip from the leaves or branches. Of course, touching the tree, eating the fruit, or coming into contact with the bark is extremely dangerous. Those who are exposed to the toxins may experience burning, itching, and allergic reactions including swelling of the throat, eyes, and mouth, as well as blistering. Blistering of the skin has been reported by those were touched by just a small drop of sap from a nearby tree. Ocular injuries have been reported in areas where smoke from burning trees was present. Those who have mistakenly eaten the fruit and lived to tell the tale describe the manchineel as pleasantly sweet at first, followed by a peppery, burning sensation and tightening of the throat. Scientists are unclear on the exact makeup of the tree’s toxins, although it does contain phorbol, which is a highly water-soluble skin irritant. This explains the increased risk of exposure due to rain, as phorbol components dissolve easily into raindrops and can be spread to anything nearby. Even cars parked under the tree are at risk of being corroded by the dangerously strong toxic sap. In many parts of the world, the trees are identified with warning signs. Some are marked with a red X or a red band, while others have more specific signage posted. On the island of Bonaire, the trees are unmarked, so visitors must be vigilant. Although the plant is extremely toxic, it is nonetheless used for timber in the Caribbean. The sap is removed by drying cut branches in the sun. It is also reported that gum made from the tree bark can be used as a treatment for edema, an abnormal retention of fluid under the skin. Dried fruits of the tree have also been used as a diuretic. The tree is as toxic to most animals as it is to humans, but there is one species of iguana, the black spine iguana, which is known to live among the branches of the tree and even eat the fruit. 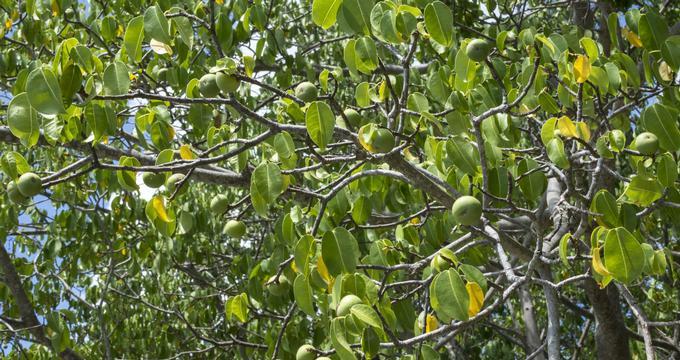 History: Most stories of run-ins with the manchineel come from literature and novels, which tell tales of exploration, pirates, being shipwrecked, and washed ashore on a secluded island, only to find the manchineel as the sole source of fruit. The manchineel and its toxic effects make for a dramatic story. Almost immediately after its discovery, the manchineel was appearing in opera, novels, and dramas. In the 1865 German opera L’Africane, the heroine commits suicide by lying under a manchineel and inhaling the fumes of the tree. Both the Calusa, native peoples of the southwest coast of Florida, and the Caribs were known to use the sap of the manchineel tree in warfare. The latter group used the leaves to poison the water supply of their enemies. The manchineel is currently on the endangered species list in Florida. For visitors who are looking for one, it is most common in the coastal mangrove forests of Flamingo in the Everglades National Park, and can be found in clusters on some of the smaller key islands, such as Key Largo and Elliot Key.